Advancements in C-arm technology have been minimal in the past year. After all, engineers can come up with innovations only so fast, and this area of radiology witnessed rapid development in the two previous years. Incremental modifications have been made in existing technology, including systems to reduce radiation dose to both the patient and the user. The reason for the shift is crystal clear: Flat-panel technology provides better image quality, and the newest models have become more reliable because they have less chance of overheating, which can result in shutdowns during procedures. While Ziehm usually ends up last on alphabetical lists of C-arm suppliers, it was the first company to bring flat-panel detectors into this imaging area. Specializing in mobile C-arm technology for nearly 40 years, it has introduced new products such as the compact Solo C-arm that produces high-quality images while requiring minimal operating room space. And the Ziehm Vision RFD, the company’s mobile interventional suite, was the first mobile C-arm to be used in hybrid room applications. But Greg Jett, Ziehm’s marketing manager for the Americas, says the company’s most recent innovation is a new software interface called SmartVascular, a solution designed to simplify vascular surgery and produce results in only a few steps. “The software is revolutionary. It operates like an iPad,” Jett says. The software introduces new workflow designed to produce fast results, raise efficiency levels, eliminate interim C-arm operating steps, and automate imaging processes. SmartVascular is compatible with all Ziehm Vision C-arms and tailored to vascular procedures. SmartVascular software is compatible with Ziehm’s Vision C-arm portfolio. Equipped with Ziehm’s latest flat-panel detector technology it delivers distortion-free images and a wider field of view and is particularly suited to vascular surgery. Its square, 30-cm X 30-cm flat-panel detector increases the field of view to 2.5 times that of conventional devices, enabling even peripheral vessels to be easily visualized. According to the company, with a 20-kW generator, the C-arm produces high-contrast images of even fine vascular structures with more than 16,000 shades of gray. The software solution enables vascular surgeons to quickly postprocess x-ray images that support decision making. 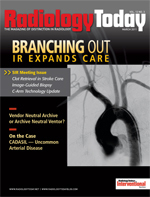 Surgeons can use the software to create digital subtraction angiography at any time during an operation without using the touch screen as an interface. SmartVascular automates all MSA (maximum opacification sequence) and RSA (roentgen stereophotogrammetric analysis) process steps, allowing complex vascular procedures to be planned and performed with minimum amounts of contrast media and shorter fluoroscopy times. Meanwhile, Ziehm is working on other software innovations, according to Jett. “Through the next two years, we will be working with product development teams on the orthopedic and cardiovascular markets and applications. We’re seeking to push the boundaries for 3D high-speed vascular image acquisition,” he says. Philips is another flat-panel C-arm pioneer. Its Veradius x-ray system utilizes a flat-panel rather than the conventional image intensifier, which had been state of the art in interventional radiology and cath labs for about 10 years. “But its deployment is no longer restricted to interventional radiologists and cardiovascular surgeons,” says Manum. Veradius frees up space in the operating room setting and, most importantly, offers a higher dynamic range, better image contrast and resolution, and less distortion, according to the company. “Surgeons need to have the most accurate portrayal of anatomy, as the image on the C-arm guides the procedure. Decreasing distortion supports improved diagnosis and treatment,” says Manum. The system can be used for a wide range of procedures, including abdominal aortic aneurysm repair, coronary angiography, orthopedic procedures, and neurologic stimulation. Flat-panel detectors have improved patient and user safety in terms of dose, but Philips wants to reduce dose even further. GE Healthcare’s OEC 9900 Elite allows surgeons to obtain sharp images in the most complex endovascular cases. The Mobile OEC Hybrid OR solution provides superior C-arm and multimodality images viewable in a comfortable and convenient fashion. “Our solution also includes the NuBOOM visualization system that puts as many high-quality, multimodality images as needed in front of the surgeon,” says Elizabeth Usher, chief marketing officer for GE Healthcare’s surgery group. The GE system uses an image intensifier rather than a flat-panel detector, which GE says performs better in some situations. Background anatomy is attenuated, and contrast-filled vessels are enhanced. Users can create imagery similar to DSA images in motion, saving the number of runs, contrast injection, and potential radiation dose. The exclusive SmartView pivot joint allows for a freer range of motion to help correctly position the C-arm. “Better positioning reduces dose and improves procedural workflow because it eliminates the need for additional images,” says Usher. The OEC 9900 Elite MD is the only mobile C-arm that offers remote user interface, allowing surgeons to control the C-arm from a tableside panel. Berthe says Toshiba is looking to develop a flat-panel system with a detector sized for physicians focusing on cardiovascular work. “We’re looking at the cardiac space and in the hybrid market, which is an emergent market, where there is a need for a cardiovascular panel size for those doing a mix of cardiac and vascular,” he says. As such, Toshiba is in the process of adding to its product family a ceiling-mounted system with a 12 X 12 detector that can be combined with the company’s tilt cradle table and even third-party tables that will result in an advanced hybrid system.